Viruses are not cells and are metabolically inert outside of living cells. They can infect organisms consisting of just one cell, such as a single bacterial cell, or the individual cells of multicellular organisms such as humans. They are small compared to the cells they infect and as such must live as intracellular parasites . They absolutely require cells to reproduce. Within the appropriate cell, viruses are able to program the cell to replicate themselves by hijacking the normal cellular systems. The extracellular form of a virus, also known as a virion, is stable enough to survive the conditions required for transmission from one cell to another. The virion is composed of a set of genes (encoded by ribonucleic acid [RNA] or deoxyribonucleic acid [DNA]), which is protected by a protein -containing coat. The coat is often characterized by regularity and symmetry in its structure and is capable of binding to and invading cells. On invasion of a susceptible cell the virion is disassembled to release the viral genome . Once the viral genome is released, viral genes are expressed to reprogram the biosynthetic activities of the cell so that large numbers of progeny virions may be produced by the cell. These virions are then released by the infected cell to invade other cells so that the process can be repeated. Flint, S. J., et. al. Principles of Virology: Molecular Biology, Pathogenesis, and Control. Washington, DC: ASM Press, 2000. 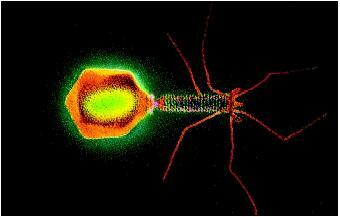 A colored transmission electron micrograph of a T4 bacteriophage virus.